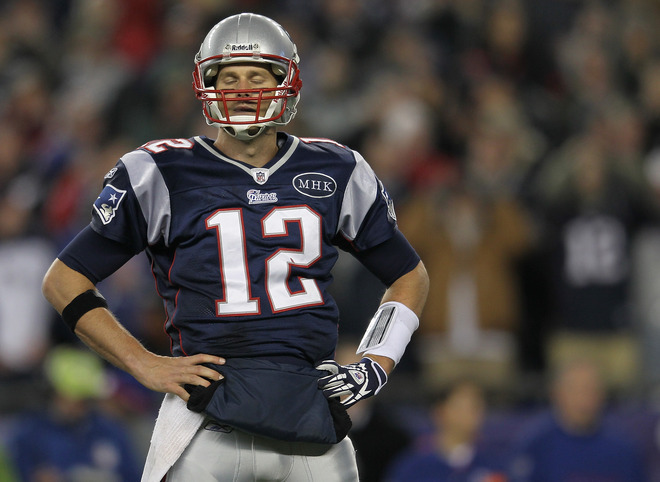 1) AN ELITE OFFENSE CAN ONLY TAKE YOU SO FAR….JUST ASK THE NEW ENGLAND PATRIOTS…. The New England Patriots defense is holding the entire team back, and it is starting to show in the teams record, and in Tom Brady’s on-field performance. Brady is throwing for over 100 yards more per game this season then he was in 2010. He also has 10 interceptions, compared to 4 last year. The days of blowout victories in New England are over. Brady is now in a position where he has to throw the ball a lot more, because he can’t rely on his defense to stop the opponent. It doesn’t matter when you score 35 points and the other team scores 36. Tom Brady is Tom Brady. He is the “Golden Boy” and the Gold Standard for what a QB is supposed to be in the NFL. His receiving core of Wes Welker and dynamic Tight Ends Aaron Hernandez and Rob Gronkowski can light it up for 40 on any given game. But for a team to be effective, the defense has to be a fitting complement, which the Patriots defense is anything but. There is no more Richard Seymour, Tedy Bruschi, Mike Vrabel or Rodney Harrison. The defense has gotten younger, and with youth comes inexperience. You can’t put any faith in a defense that has proven time and time again that it can’t stop anybody when the game is on the line. Just look at yesterdays game against the Giants and you can see the issues. Despite holding the Giants to 0 first half points, the Patriots defense would allow 24 points in the 2nd half, including a game-winning touchdown drive in the last 2 minutes that cost the team the game. Just another prime example of a team that can’t make the stops in crunch time. The New England Patriots will make the playoffs. Even with all of the problems this team has, they are still a respectable 5-3 and still sit atop the AFC East. Tom Brady and that offense is good enough to carry this team far, but not far enough. If they want to make any noise come December/January, then they have to fix the problems on Defense and come up with some kind of scheme that can hide their glaring weaknesses, especially in that weak secondary. As the old saying goes, Defense wins Championships. The Patriots won’t be winning any Super Bowls with that Defense, believe me. 2) ELI MANNING AND THE NEW YORK GIANTS ARE PLAYING OUTSTANDING FOOTBALL….BUT I STILL WONDER HOW FAR THEY CAN REALLY GO…. It wasn’t too long ago where New York Giants Quarterback Eli Manning came out publicly and said that he deserves to be mentioned in the same elite class as QB Tom Brady. Many laughed at that suggestion, as even though Manning has proven to be a winning NFL QB, he has never really elevated his game enough to be put in the group of a Brady, Rodgers and Brees. He has proven to be inconsistent at times and very sloppy with his turnovers. This year, Manning has changed all of that and shown that he can be just as good as the above names. Eli has thrown for 2377 yards, 15 Touchdowns and only 6 Interceptions through 8 games. His turnovers are down across the board, coming off of a very flimsy 25 picks and 7 fumbles in 2010. 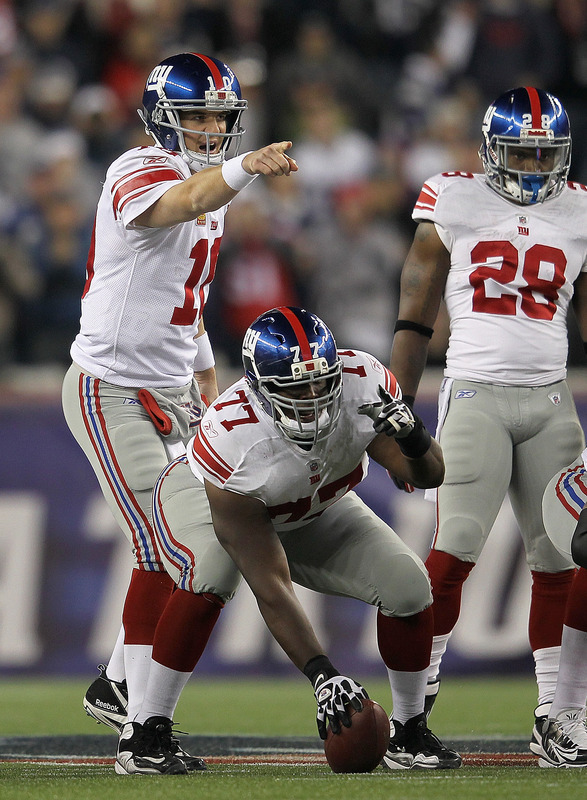 When Eli is playing effectively, it shows in the Giants record. New York currently sits at 6-2 and with a 2 game lead over the Cowboys and Eagles in the NFC East. But how much longer can this good fortune really last? Not to put a damper on what the New York Giants have been doing, but I really can’t put much stock in this team, at least right now. The season is still far from over, and if any team has more hurdles to jump over then the Giants in these remaining games, then have mercy. The Giants have 8 games remaining on their schedule, and their opponents have a combined record of 40-24. These games include @San Francisco (7-1), vs Green Bay (8-0), @New Orleans (6-3), as well as a divisional game against the Eagles in 2 weeks, and 2 more divisional games against the Dallas Cowboys. The Giants overcame one obstacle by defeating the then 5-2 New England Patriots yesterday afternoon, but the road to the playoffs does not get any easier from here. 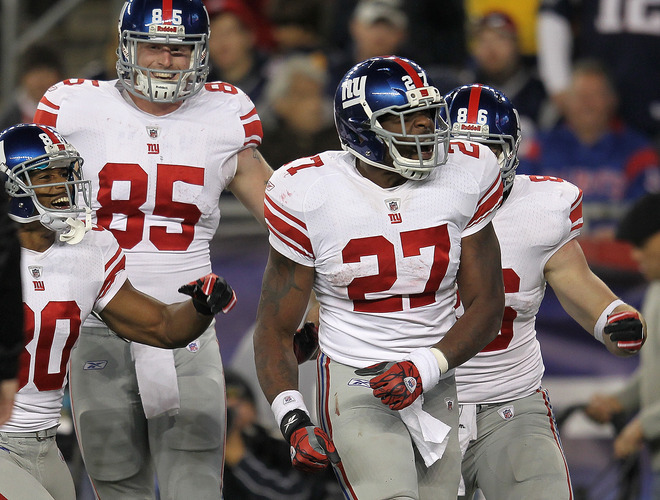 The talent and momentum is their for the Giants. Eli Manning is playing his best football since winning the Super Bowl. He has a talented group of receivers in Nicks, Manningham and team surprise Victor Cruz, as well as a balanced running game with Bradshaw/Jacobs and a defense that is finally getting its act together. I am not saying that the Giants can’t win a majority of these 8 games, win the division and make a deep playoff run, but boy is it going to be difficult. Raise your right hand if after 9 weeks, you predicted the Cincinnati Bengals would be at the top of the AFC North with a 6-2 record? Don’t worry, I am not going to raise my hand either. With teams like the Buffalo Bills and Detroit Lions making huge turnarounds this year and hogging the spotlight, the Bengals are quietly making progress of their own. Progress that not a lot of fans and experts saw coming. The youth movement in Cincinnati started when the Bengals selected WR A.J Green with the 4th overall pick in last years draft. Selecting Receivers in the first round can be a risky proposition, but Green has been a pleasant surprise for Cincinnati. After 8 games, Green leads all rookie receivers with 40 receptions, 600 yards and 5 touchdowns. Those stats also make him the 15th ranked receiver in the entire NFL. However, for Green to be effective, the Bengals needed the QB for the future, and they have found that in QB Andy Dalton out of TCU. Carson Palmer was clearly not going to be around much longer, so the Bengals took a gamble and selected Dalton 35th overall. As an undersized QB with a tendency for making short, yet accurate passes, many wondered if he could take it to the next level as a starter in the NFL. 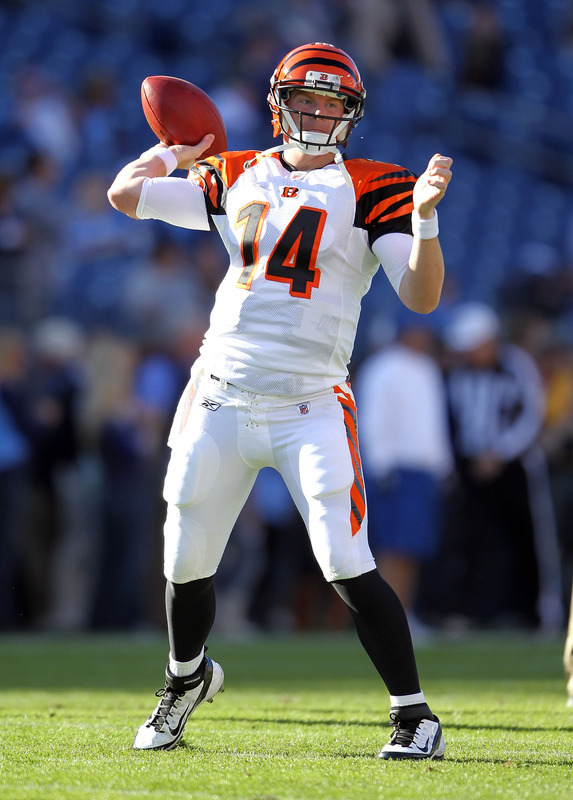 So far, Dalton has proved his worth, with an 85.0 passer rating and an efficient 12:7 Touchdown to Interception ratio. The rest of the team is no slouch either. The Defense is currently ranked 4th in the league, allowing only 300 yards of total offense a game. WR Jerome Simpson and TE Jermaine Gresham have also proven to be viable assets in the passing game, complementing Green. On Sunday against the Titans, the Bengals were able to overcome a 17-7 third quarter deficit and rally behind Andy Dalton’s 3 second half touchdowns and win the game 24-17, pushing the teams winning streak to 5 games and a overall record of 6-2. It is the longest Bengals winning streak since 1988. Regardless of the quality of opponent (wins over the Colts and Jaguars), a 5-game winning streak is nothing to scoff at. The Bengals still have 4 games remaining against AFC North rivals the Baltimore Ravens and Pittsburgh Steelers, and in that we will see if the Bengals are playoff contenders or not. Regardless, you have to love how the Bengals are playing right now. The throwing combination of Andy Dalton to A.J Green has the potential to be one of the best QB/WR tandems in the league. The era of Palmer, Housh, Owens and Ochocinco is over. 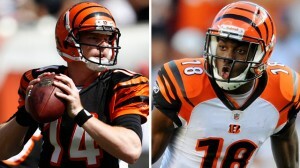 The Dalton to Green era is here and that has to make Bengals faithful awfully happy.